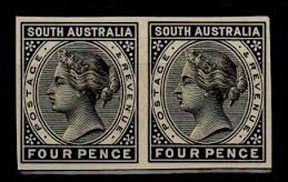 Imperforate – The Australian Philatelic Society Inc.
Not separated by rows of perforations. Separation is the means by which individual stamps are made easily detachable from each other. In the early years, from 1840 to the 1850s, all stamps were imperforate, and had to be cut from the sheet with scissors or knife. This was time-consuming and error-prone (as mangled stamps of the era attest). Once reliable separation equipment became available, nations switched rapidly. Imperforate stamps have been issued occasionally since then, either because separation equipment was temporarily unavailable (in newborn nations for instance), or to makers of automatic stamp vending equipment (the United States did this in the 1900s and 1910s), as novelties for stamp collectors (particularly when stamps are issued in souvenir sheets), or as errors.